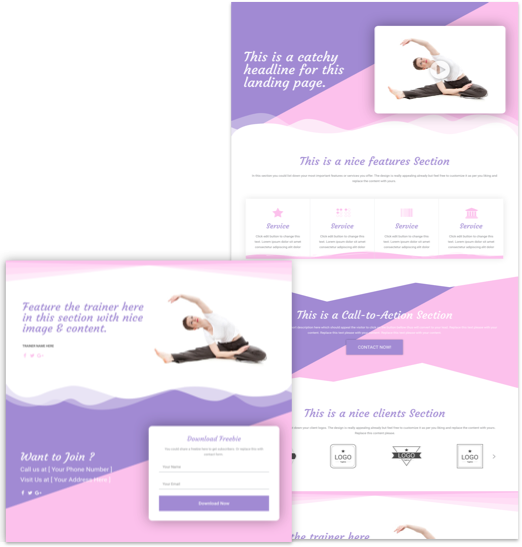 A clean and lively landing page template for Yoga, Fitness and similar niches #MadeInElementor. Concept for this template was to use as less images possible and play with the Elementor’s Shape Divider, Gradient & other features to make it eye catching & lively. This Free Elementor Template is designed keeping in mid the Yoga website mainly but can be tweaked easily to any niche by changing the color scheme & typography & some minor tweaks to the shape dividers, etc. The concept was to utilize the Elementor’s great features such as Shape Divider on sections, gradient effects which are so powerful and allow you to design a beautiful eye catching landing page without the heavy use of images which are hard to find and also increases the page loading time. So avoiding the background images, in this template gradient effect is used on sections with tweaking the gradient colors location and angle to make it splitted color background look& than the cherry on the cake is the availability of Shape divider in Elementor which make it really nice. This is a two equal columns layout with gradient effect on the section and also used shape divider on the bottom. Left column contains text content & the right column has a video which opens in light-box. All done with elementor. For the services section Elementor Pro‘s Flip box module is used with the Hover slide effect and again gradient effect is used on hover and also on this section shape divider is used on bottom to make a nice effect. This is a basic 1 column section with gradient effect with same settings as the hero section and also have a shape divider on top & bottom. This is also a simple 1 column section and for the logos we used the image carousel module. This is a 2 column section where you can feature the main trainers, additional trainers may also be added easily by cloning the section or you may use a grid section bellow that using the image box module to feature other trainers. A 2 column section with the same gradient effect as in the hero section and shape divider on top. Here we used the Elementor Pro‘s Form module for creating the form on the right. I hope you like it and while using it i suggest you to make some changes to make it yours so you won’t end up having a similar website / landing page to others. Just some small change in color scheme / typography would also be enough, this will make your website look good.